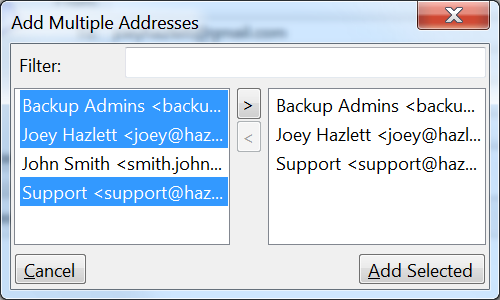 Today I’ve released a new version of SMTP Mail Sender that allows you to select multiple address book recipients at the same time. In the past, you’ve had to click the icon and then choose each name individually. A user recently suggested that should be a better way to do it. I agreed, and have implemented this new feature in version 1.0.0.18. You can download the newest version from the SMTP Mail Sender page. I also took the chance to fix a weird bug where if you had only half a configuration file, the application wouldn’t let you open the settings dialog to make changes. It should not crash anymore if that is the case.